Ask any old Wuffler today, if he or she has heard of the name Villiers. The majority will yes, and mention the once great engineering works in the street that bears the same name in Blakenhall. Not all though a few will associate the Villers mark on our town with Charles Pelham Villiers who to this day holds the record as the longest ever serving member of Parliament.serving his adopted town in an unbroken spell for sixty-three years, and whose statue still stands today in town, brought about in the 1870’s with funds raised by a grateful townspeople. As you can see the statue was originally erected on Snow Hill close to The Agricultural Hall it was nine foot tall and made of Sicilian Marble and was unveiled to an appreciative audiences 1879. In 1931 due to the increasing volume of traffic around Snow Hill, It was decided to relocate it. The great sculptor Sir Charles Wheeler who was born in Codsall and attended the Wolverhampton School of Art was asked for his opinion on a new site, to which he was said to have replied, “To the West Park behind a bush”. The statue was indeed moved to the West Park joining the handsome bandstand Villiers had previously donated to the park. 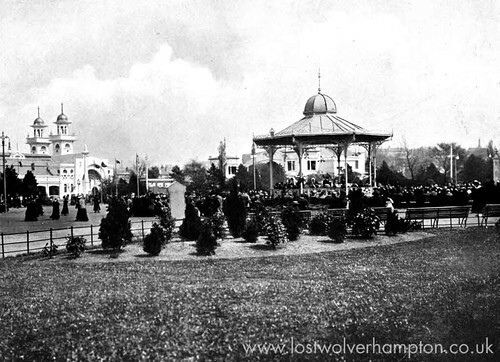 Here we see the bandstand complimenting the many elegant structures erected for the Great Exhibition in the West Park in 1902. EVEN WITH A WILL THERE WAS NO WAY… A Vignette of this long serving member. 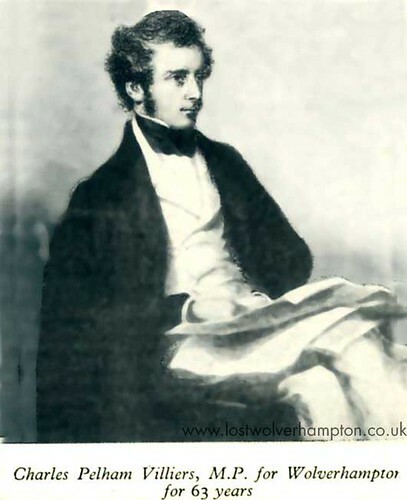 Charles Pelham Villiers was M.P. 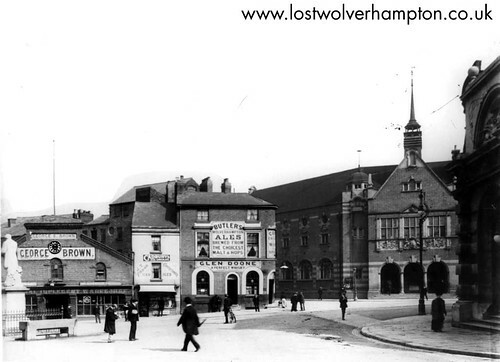 for Wolverhampton from 1835 to 1898 a record in length of service to one constituency – never likely to be equaled. As a young man he was curly headed, handsome, bright-eyed, and a bit of a dandy, yet he died a bachelor and many years after women who had loved him had gone to their graves. As a Parliamentarian, Villiers took his duties seriously and, tho orator, was a frequent speaker in the house. His devotion to Free Trade and services to the party brought him office and a Privy Councillor-ship. He was reputed to be well off and when he retired from office in 1866 his friends were surprised that he signed a statement to the effect that his means were inadequate and applied for the pension to which ex-ministers were entitled. He was awarded £1,200 per annum and drew it for thirty-two years. When he died and the details of his will where published there was an uproar. he left an estate valued at over £300,000. The obvious explanation was that Villiers had perjured himself to get the pension but this seemed totally at variance with his character. When the true facts were brought to light, his friends faith in him was justified. When he was still young, Villiers had met the only daughter of a wealthy merchant. For years he had resisted the attractions of some of the prettiest girls in London society, as he lived only for politics. He lived and moved and had his being in the House of Commons, though he was no Misogynist. An important debate in the house was of far greater consequence to him than amorous adventure. But the young lady in this case was not to be persuaded that he could remain impervious to her charms. She proposed to him, only to be told that he had made up his mind not to marry. She died a few years later and her solicitors wrote to Villiers to inform him that, shortly before her death, she had bequeathed the whole of her fortune to him. He at once replied that he could not in no circumstances accept a penny of the money and preferred that it should be distributed among the lady’s relations. He could not consider benefiting from an affection that he had been unable to reciprocate. The thought was repellent to him. The solicitors replied that they had no option but to carry out the terms of the will but Villiers remained adamant. When the executors paid the money into the bank in his name he completely ignored its existence. The fortune accumulated but even in his will he made no reference to it. When he died at the age of 96, the last of the original champions of Free Trade and a rather grim old man the existence of the fortune came to light. 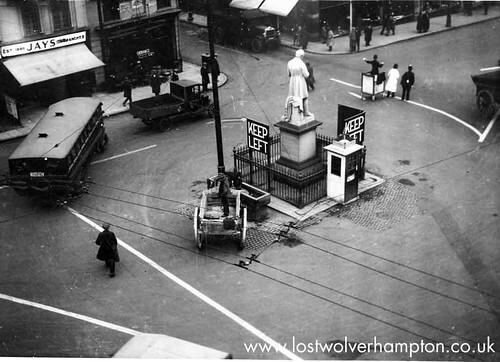 Incredibly, despite his six decades of service to the people of Wolverhampton, it was claimed that he never once visited the town. 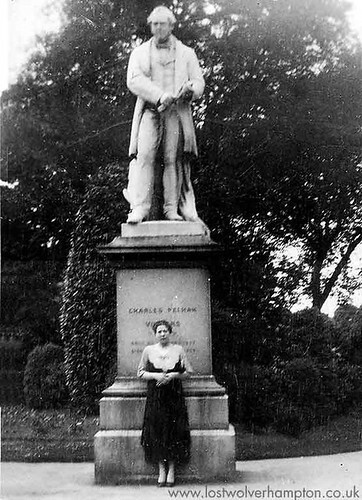 I dedicate this little post to Francie Wright who is seen posing in front of the Villiers Statue shortly after it was removed to the West Park. I believe Francie was my fathers first girl friend.